This happens often... I window shop online and save my faves in a folder on my desktop. When I review what I've saved, they fit a color scheme. That was the case here. I know bright, cheery colors are in at the moment, but for whatever reason I am loving browns, whites and golds right now. They are just pretty and sophisticated to me. That swimsuit is a bit of an exception here. I love that pattern and the colors and I couldn't help myself. 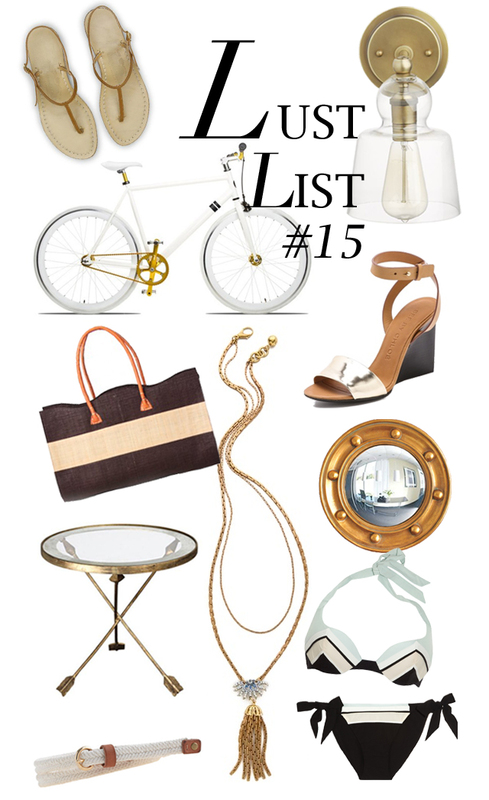 This list is fabulous and I'm mildly obsessed with that bikini! How rad is that bike?!!! Love it! That bike is insane! Love everything! Great list! Love that porthole mirror!